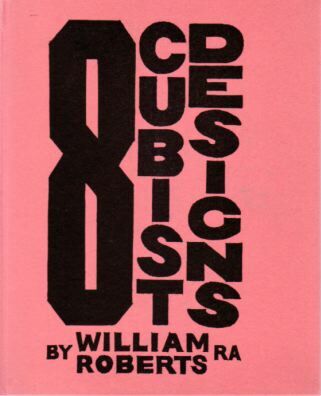 This piece first appeared as the preface to 8 Cubist Designs (London, 1969); the present text is that reprinted as 'Cubism and After' in William Roberts, Five Posthumous Essays and Other Writings (Valencia, 1990). © The Estate of John David Roberts. Reproduced with the permission of the William Roberts Society. Of the eight drawings reproduced here five are preparatory designs for two of the four paintings 'Theatre' and 'Twostep', that I exhibited with the Vortist [sic ] Group at the Grosvenor Gallery in the Spring of 1915. [Roberts appears to be misremembering the location of 'Vorticist Exhibition. The Vorticist Group: The First Exhibition of the Vorticist Group', which was held at the Doré Galleries in JuneJuly 1915.] The other two paintings shown on that occasion have disappeared, as also their preliminary designs; although the sketch entitled 'Dominoes' could be a rough draft for one of these lost pictures, that was named in the Grosvenor Gallery catalogue as 'Le Jeu'. The 'St. George' drawing is a study for the line block, that was reproduced in the Evening News in April, 1915. 'Street Game' as far as I can remember at this late date, was not developed beyond this first stage. At the time of the Wyndham Lewis retrospective exhibition at the Tate Gallery, my contribution to the Vorticist movement was somewhat disparaged in certain quarters; and with regard to this, I found myself in a rather difficult situation, for there was only my word as evidence that I had ever shown four large abstract paintings in the 'Group's' first exhibition. Consequently when at Sotheby's invitation I was able to authenticate these early drawings of mine, I was much elated. They had been sent for auction and I was told they were the 'Property of a Gentleman', more than this was not disclosed. 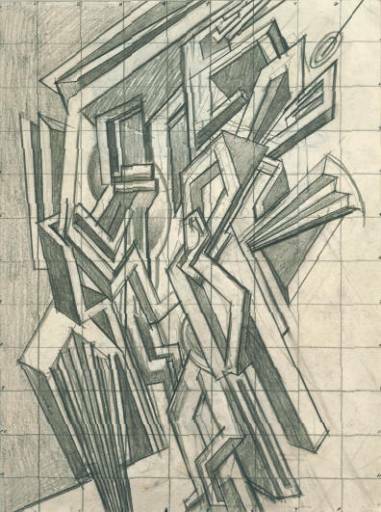 I have used the term Cubist in referring to these drawings, because in my opinion the word Abstract has fallen into disrepute. Today we no longer have artists producing abstract paintings, but 'Abstract Artists' who do 'Abstracts'; the word sets one's teeth on edge, as do the 'Abstracts' themselves. These 'Abstracts' fall into two groups; the rigid flat pattern, tee-square and set-square type, with Mondrian as their chief exponent; and the smudge, slush, wurly-curly sort, favoured by the Americans. Both these brands are now turned out by every art school in the land. These student 'Abstracts' reach the public galleries under the slogan, 'The Young Contemporaries', a title which seems to imply that the organisers of the group have the power to grant its members eternal youth; a useful advantage this, when they confront less fortunate groups whose members continue to grow old. To this flow of student 'Abstracts' must be added the large output of 'Child Art' from the Elementary schools. The dazzle of publicity directed upon such a combination, would leave the work of the mature non-abstract artist, or to use a favourite term of the 'Abstracters' the 'Figurative' painter, rather in the shade. Some evidence of this, is the exhibition by 'The Young Contemporaries' to be held at the Royal Academy in the near future. Also we shall shortly see in these same Galleries, a show of 'Child Art' financed by a Sunday newspaper, and under the chairmanship of an architect Royal Academician who is an enthusiast for the art-work of children. This time it will not be the work of one child that has slipped into the Summer Exhibition by chance, but a triumphal entry of all the kids. As the organisers would like to make this an annual show, who knows, perhaps in time, the kiddies will have a president of their own at the Royal Academy. However, I should warn 'The Young Contemporaries' to be watchful of the competition from these artists of the kindergarten for among them they may find their most dangerous rivals. The spread of the 'Abstract' cult owes much of its vogue to the support of the Press; the large prizes offered by rich industrialists  which they consider to be 'Prestige Advertising'  and the literature of the Avant-Garde art critics, that is to say, those critics whose articles are more abstract than the painter's work they pretend to explain. This patronage encourages the students to turn out 'Abstracts' of enormous sizes. And as the paint is flung around the Art School studios in all directions, their 'Instructors' stand by and watch; for they know 'this stuff' cannot be taught; moreover it would be a mistake to intervene in the action of this 'inspired' paint slinging. The theory of the art critics is, that Picasso developed his cubism from the study of Cezanne's work. But Max Jacob the French writer, and friend of Picasso, has stated that it was evolved by the artist from his habit of doodling on the table tops of the cafés he frequented. I rather favour this latter opinion, for there is a kind of doodling quality on the abstract side of Picasso's painting. Also despite the æsthetics, and pseudo profundities of the catalogue introductions, the word that best symbolises the contemporary abstracts is not Actionism, Expressionism, or Social Realism, but Doodleism.